Plants need phosphorus for developing a strong root system and blooms; and potassium for immunity and the quality of fruits. Plants with green parts need some more nitrogen. Adding wrong fertilizers can result in weaker root system, too fast growth or poor resistance against disease. Never fertilize randomly; first check which nutrients are needed in the soil. First use all the possibilities of home fertilizers, and then add mineral fertilizers if needed. If soil analysis shows extreme lack of any of the nutrients, add mineral fertilizers accordingly. If plants show signs of the lack of any nutrient, add them with foliar fertilizers which get absorbed quicker. If soil analysis shows surplus of some elements, don’t fertilize with them for a few years. Follow the instructions included on the purchased fertilizers to avoid overdosing. Fertilize moderately – excessive use of fertilizers harms the plants and the environment. When preparing a new location for a garden, plant green fertilizing plants first. The same goes for preparing a new lawn or orchard. Legumes almost don’t need any fertilizing; bulb and leafy vegetables are fairly demanding in this regard, and fruit, brassica, root and tuber vegetables are more demanding. Mineral fertilizers are artificially produced, water-soluble and come in fluid or solid form (powdered or granulated). You can also use foliar fertilizers that have a quicker effect as they get absorbed directly where the plant needs them. There are complex fertilizers, which contain a mixture of different nutrients, and straight fertilizers, which contain only one. Fertilizers get absorbed into the ground and excessive fertilization causes draining into groundwater. Organic fertilizers include barn manure, compost, wood ashes, grape’s skins, plants for green fertilization etc. These fertilizers release slowly and don’t harm the groundwater. For the proper effect of these fertilizers, the ground must be airy, moist and alive. Purchased organic fertilizers are a good substitute for compost, but they lack the permanent humus which softens the soil. Combine purchased organic fertilizers with plants for green fertilizing. When using barn manure, it is enough to fertilize only once every three years, as the nutrients release slowly. Dig barn manure into the upper layer of soil to avoid bad odor and loss of important nutrients. Use approximately half year old barn manure, and fertilize with fresh barn manure in autumn, so it will decrease during winter. Avoid using barn manure and lime together, as lime can decrease some positive effects of the manure. 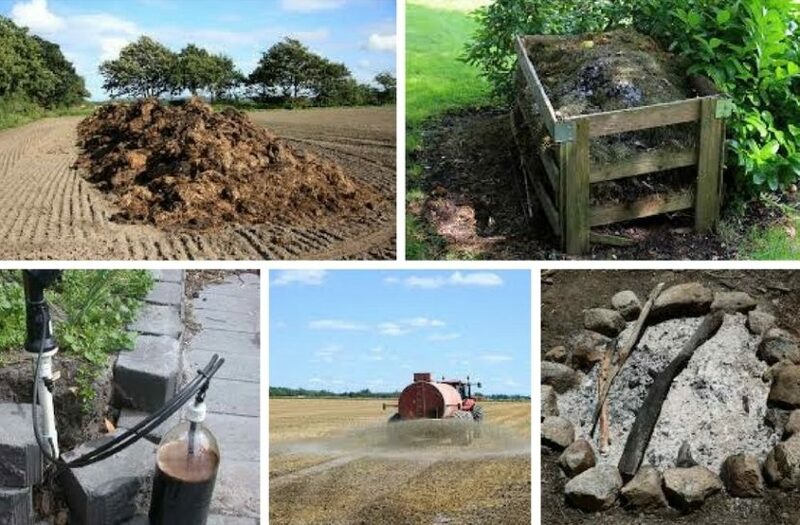 Horse and cow manure have similar structure; pig manure contains more potassium and nitrogen (and less calcium); poultry, sheep, goat and rabbit manure are rich in phosphorus and nitrogen. It is good to know the agricultural methods of a farm that supplies you with barn manure. Compost fertilizing is the best method as you use your garden and kitchen waste at no cost. Use compost after a few months when it sits. Start using the lower layers first. Set aside a part of your lot for compost in the shade (or semi-shade) and make sure it doesn’t gather excess water. Leave the lower part open and enough space for air between the side boards. Avoid locating your compost at the border with your neighbors, and too close to your garden, as it might serve as a refuge for snails and mole crickets. Spread a bunch of branches at the bottom to enable air flow, and then continue with not too thick layers of mixed waste, barn manure, cut grass, garden soil etc. To decompose properly, compost has to be airy and moist (water if needed), and have access for earthworms. Do not put on the compost: diseased or molded parts of plants, non-degradable waste, uncut branches, chemically processed fruit peels (citruses), root weeds, absinthe (it repels earthworms), pet or chicken manure, meat waste or bones, florist flowers. Green fertilizing is useful in a new garden or when you prefer purchased organic fertilizers to barn manure. Plant crops for green fertilization in garden beds. You can cut them several times and use for mulch. In spring, dig into soil what is left and freezes during winter. The best crops for softening and airing the soil are oil radish and white mustard due to their fast germination even during fall. They don’t last over winter, so dig them frozen into soil. Crops for green fertilization: white, black, underground, Persian and Alexandrian clover, crimson clover, white mustard, oil radish, Lucerne, common bird’s foot trefoil, blue curls, buckwheat, wheat, barley. Best green fertilizers in greenhouses are wheat and barley. Plant tagetes, calendula and Indian cress across beds for soil disinfection in the cases of fungal disease. After the clovers plant Indian cress, peppers, eggplant, zucchini, watermelons, melons and cucumbers the following year. After the clovers, don’t plant legumes in the following 2 years. To enrich the soil with nitrogen, use clovers and legumes. Cut the plants and use them for mulch, and leave the roots in the ground. To add phosphorus, use lamb’s quarters, common purslane, common vetch and datura. Use it for mulch, but be careful: these are weeds – use before they bloom. To add potassium, use radicchio, endive, chickweed, plantain and common vetch. To add calcium, use buckwheat, dandelion and melon leaves. Add silicon with nettle, banana, couch grass or horsetail mulch. To add sulfur, use bulb crops, cruciferous plants, lamb’s quarters and purslane. In fall, you can use legume seeds before the end of their germination period and leave over winter. The effects of green fertilization are not seen immediately; it takes a few years. Combine them with green fertilization plants to make the soil softer. Check what the fertilizers are made from. When looking for a quality fertilizer, check the list of approved fertilizers by the corresponding control organizations. Follow the instructions for use thoroughly. The advantage of purchased organic fertilizers is that they are thermally processed and disinfected of all weeds or pest eggs. Soak green parts of plants in water for a few days (until it stops foaming). Liquid fertilizers have an unpleasant odor so you have to find a proper place to prepare them. Don’t prepare them in metal containers. Remove the firm parts of the plants and put them to your compost. You can keep the liquid in sealed containers and in a cool and dark place over a longer period of time. Test the fertilizer on a smaller part of the garden bed to check if it needs to be diluted. Use liquid plant fertilizers in the afternoon, in the evening or in cloudy weather. Never pour on leaves or dry soil. Nettle liquid fertilizer (1 kg / 2.2 lbs fresh plant in 10 l water) contains a lot of nitrogen and microelements and can be used for all crops, while it is best for brassica vegetables and leafy greens. Common comfrey fertilizer (1 kg / 2.2 lbs fresh plant in 10 l water) contains a lot of potassium and nitrogen and can be used for all crops once a week. By mixing the two (after preparing them separately) you will get the most versatile fertilizers. You can make herbal liquid fertilizer by soaking the herbs in water over winter and use in spring in the whole garden. Use horsetail, chamomile, valerian, dandelion, marjoram, garlic/onion leaves etc. You can make compost tea as well: in a container, pour water over some compost and leave the firm parts to sit down. Use the water – compost tea as a mild fertilizer. It contains a lot of potassium and repels slugs, caterpillars and lice. Scatter it moderately around the plants during summer. It is best for brassica vegetables, leafy greens, root vegetables and celery. Use for covering the ground for protection and alleviating the effects of the weather, as well as avoiding erosion. Mulch keeps the soil moist and soft, slows the growth of weeds, release nutrients to the soil and benefit the microorganisms in soil. Make the mulch at least 3 cm (1.1 in) thick and add if needed. In humid weather check under the mulch to avoid slugs hiding there. For much, you can use straw (at least 3 cm / 1.1 in), cut grass (dried for at least 1 day, at least 15 cm / 6 in), bark (at least 7 cm / 2.7 in), newspapers (7 layers), compost, wool or cotton. To drive away slugs and snails, use elder, white mustard or forest fern mulch. Make mulch from tomato leaves or wormwood around brassica vegetables to drive away caterpillars and flea beetles. Herbs with strong aroma such as anis, fennel etc. repel plant flies. Rhubarb leaves quell weeds and repel lice and flea beetles.